In insurance parlance, many a times terminology is not properly understood for lack of definition and easy to comprehend examples. That makes understanding and interpretation much difficult as the intention behind the phraseology could not be understood. Whatever stated is from the common man’s point of view … of course there are experts. Standard Fire & Special Perils Policy - is a named peril policy and covers loss or damage to the property insured arising out of named perils of which Explosion / Implosion are amongst named perils. Going by the policy wording, the policy covers losses other than loss of, destruction of or damage to boilers, pressure vessels, machinery where steam is generated arising out of their own explosion / implosion. Thus machineries suffering damage by explosion / implosion as also caused by centrifugal forces are outside the purview of the policy BUT not the resultant damage to other insured property. Upon reading further, understand that explosion is a rapid increase in volume and release of energy, usually associated with high temperature and release of gases. Chemical explosives are common example where rapid and violent oxidation reaction produces burst of hot gas. The general properties of explosion can be stated to be : Force, Velocity, and evolution of heat. It is the rapidity or sudden release which makes things explodes. Implosion as understood in common terms is a violent collapse inward, mostly caused by compression or by forces acting from outside against it causing it to fold inwards. Here we are not referring to the demolition of civil structures and buildings that occur by the weakening and breaking of structural members by explosives. In some ways it is opposite of explosion as there would be concentration of matter and energy. It is stated that suction is more powerful than pressure. Pressure elicits resistance, suction results in general collapse attended by no resistance. The dictionary meaning of ‘Implosion’ is : 1) violent collapse inward, as of a highly evacuated glass vessel. 2) Violent compression. 3) The inward collapse of a building that is being demolished in a controlled fashion by the weakening and breaking of structural members by explosives. ~ and to understand - Implosion is a process in which objects are destroyed by collapsing on themselves. Now an implosion is in news …. ..that of a robot - Scientists speculate that a portion of their robot imploded under the immense pressures—about 16,000 pounds per square inch—in the ocean depths. The loss of the exploration vehicle won't be easy to overcome, as this is stated to be $8 million investment ~ and reported to be a tragic loss for deep science. 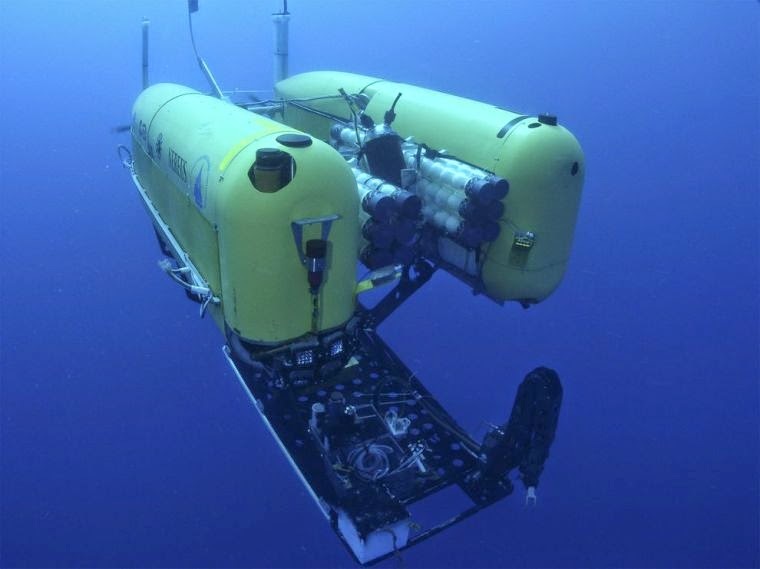 It is ‘Nereus’ a hybrid autonomous underwater vehicle ~ a type of remotely operated underwater vehicle, built by the Woods Hole Oceanographic Institution (WHOI). Constructed as a research vehicle to operate at depths of up to 11,000 metres (36,000 ft), it was designed to explore Challenger Deep, the deepest surveyed point in the global ocean. Nereus, named for Greek sea titan Nereus (who has a man's torso and a fish-tail) through a nationwide contest of high school and college students, began its deep sea voyage to Challenger Deep in May 2009 and reached the bottom on May 31, 2009. Now comes the news that the robot's deep sea adventure ends after it is crushed by water pressure while exploring a 6-mile-deep trench ~ the Nereus imploded under the vast pressure of the water above it in the Kermadec Trench to the north east of New Zealand, experts said. Here is something from the Daily Mail. It was meant to reveal the ocean’s deepest secrets, but a one-of-a-kind submersible vehicle now lies in a watery grave. The Nereus’ journey deep into the Kermadec Trench to the north east of New Zealand ended when the robotic vehicle crumpled under the pressure of the water, just over 6 miles (10km) below the waves. Scientists believe that part of the vehicle imploded under the vast pressure of the water above it - as great as 16,000lbs per square inch. The Kermadec Trench runs northeast from the North island of New Zealand to the Louisville Seamount Chain for over 622 miles (1,000km). considered the second deepest oceanic trench, it reaches a a depth of 32,963ft (10,047metres). The trench was formed by subduction, which is a geological process in which the tectonic plate is pushed beneath the Indo-Australian Plate. The submersible was lost 30 days into a 40-day mission aboard the research ship, which was carrying out the first systematic study of a deep-ocean trench as part of the U.S. National Science Foundation’s Hadal Ecosystems Study (HADES) project. Since its launch in 2008, it had also shed light on the world’s deepest known thermal vents at Cayman Rise in the Caribbean. It had brought back specimens of animals previously unknown to science on its first HADES trip. It also collected seafloor sediment to help experts reveal the physical, chemical and biological processes that shape the deep-ocean ecosystems in ocean trenches, which are unlike almost any others on the planet.